In portraits of previous presidents, the backgrounds were almost always plain and dull, nothing interesting to see. (Source: AmericasPresidents.si.edu) If anything was recognizable, it was their office, their desk, or part of the White House, but Obama is shown in a completely different context, a leafy green garden, not at the White House. The unique background raises the question, is there a hidden message? If not, why not show him in the same traditional setting as previous presidents? Hiding messages in plain sight is a common practice used by followers of occult religions. Even the word occult means hidden. Christian researcher Jonathan Kleck claims to have found a hidden message in Obama’s portrait (Source: YouTube.com). 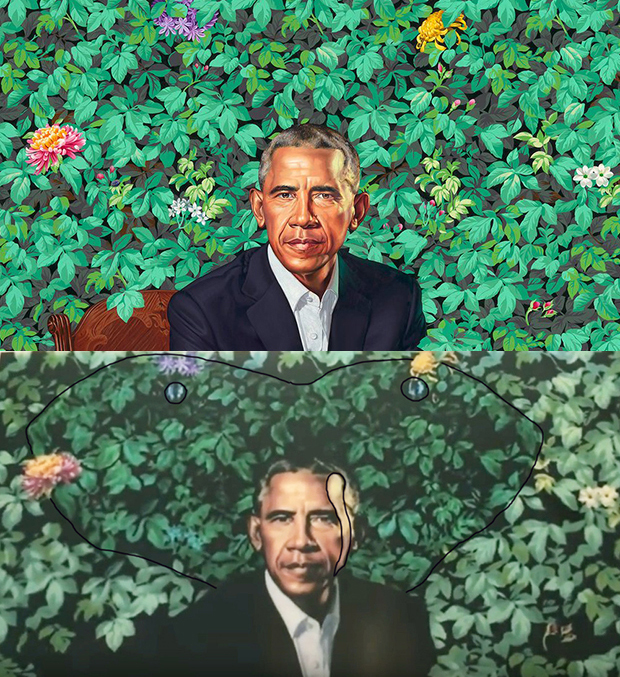 As shown in the image below showing cropped portions of the original portrait next to his highlighted version, he found the face of a serpent hidden in the leaves, including two dark round leaves perfectly positioned where the eyes would be, which he highlighted to help make them more visible. Above each eye, a flower is perfectly positioned, forming the appearance of the serpent’s eyelids or eyebrows. Between the eyes, the leaves form the bridge of the serpent’s nose. The leaves beneath each eye form the cheek bones. The outline of the serpent’s head is formed by a line of dark shadows in the gaps between the leaves. Replacing the imagery of the presidential office and the White House with the imagery of the hidden serpent in the garden makes Obama’s portrait background unlike any previous presidential portrait, showing his authority does not come from his office or from his position in the White House, but from Satan, fulfilling the Bible prophecy of the serpent, who is also called the dragon, who gives his power and his throne to the beast, the antichrist. (Revelation 13:2). In the portrait, Obama and his wooden chair are positioned so close to the garden’s leaves, they engulf him and the chair. The seat of any ruler symbolizes his authority, his throne, so the position of Obama and his chair within the garden and directly under the head of the serpent shows the legal foundation of his authority comes from the serpent in the garden, referring to the place where Satan stole Adam and Eve’s dominion in the Garden of Eden through their own foolish choices. Like a crafty serpent, he hid his true motives, persuading them to eat the forbidden fruit of the tree of the knowledge of good and evil. (Genesis 3). The leaves wrapping around Obama’s legs and the legs of his chair, even wrapping around the back of his chair, shows the serpent of the garden has his grip on both Obama and his throne. Obama is not free to go or to exercise his own authority. He is owned by the serpent, demon possessed. Obama’s head is positioned directly where the serpent’s mouth should be because the antichrist functions as the mouth of the dragon, as shown in this passage. Further highlighting his role as the serpent’s mouth, the light reflecting of the left side of Obama’s face forms the shape of a serpent’s fang, which is the source of the serpent’s poisonous venom that comes from his mouth and kills his victims, representing his power to not only kill their physical bodies, but to lead their souls to eternal doom through the many lies spoken by the words of the mouth of the man of sin. Zooming in closer on Obama’s left forehead reveals a detailed sperm shape within the fang. 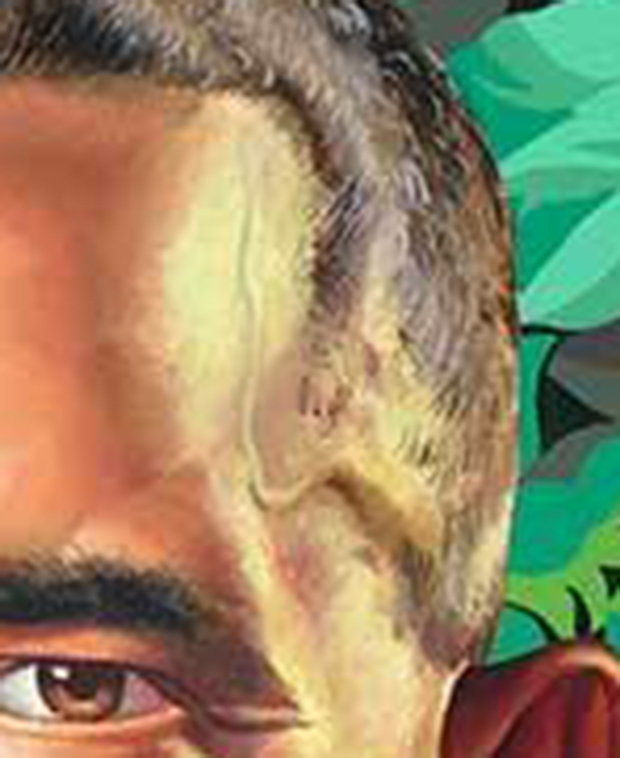 The base of the sperm begins near Obama’s left temple at the edge of his hairline and continues up the left side of his forehead, as shown in this original, unedited image below. Sperm is a symbol of fertility, which is a common theme among Satanists and occult religions because of Satan’s schemes to corrupt the seed of man by sowing his seed into the womb of a woman, bringing forth entities that are part human and part fallen angels, called Nephilim. Satan’s fallen angels violated the laws of God by coming to earth and mating with the daughters of men, as described in this scripture. The Nephilim were mighty men, meaning their strength and size surpassed normal human limitations. God destroyed them in the great flood, but Satan brought them back again afterwards. They occupied the Promised Land and fought against the Israelites through men like King Og of Bashan and Goliath of the Philistines. By corrupting the human bloodline, Satan hoped to thwart God’s plan to send His Son into the earth to redeem the sins of men, shedding His blood and sacrificing His own life to pay the price for our sins as a substitute for our lives and our blood. However, the Messiah, Jesus Christ, could only redeem what God created, human beings, not corrupted beings that were only half human, Nephilim, because they are outside the boundaries of His creation. Having failed to stop the Messiah from coming forth and accomplishing His mission, Satan continued his schemes by raising up an alternative messiah, a substitute for the true Messiah, which is the definition of antichrist. Just as God brought forth His Son, Satan is bringing forth his son, the man of sin, the antichrist, and giving him his power and authority in the earth, which explains why Obama’s head is marked with the sperm of Satan. Throughout history, fertility has been a common theme in Satanic symbols, including the crescent moon with the star resting in the middle. The star represents the seed of Satan sown by his fallen ones into the womb of the human woman, represented by the crescent moon shape. These symbols appear throughout the world today in the flags of many nations, especially Muslim nations. Positioning the sperm and fang on his left side is another Satanic reference. Although there is nothing inherently wrong with the left side or with being left handed, Satanists show their rebellion against God by featuring the left as one of the many ways they go against the grain, practicing the law of reversal, reversing God’s ways. Only about one out of every six people (15%) are left handed, including Barack Obama. 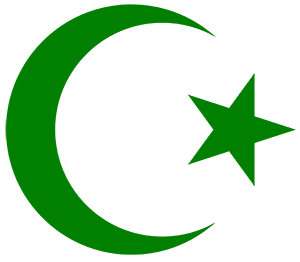 (Source: Scientificamerican.com) Other examples of Satanic reversals include inverting the cross, inverting the pentagram, reciting the Lord’s prayer backwards, and hiding Satanic lyrics in songs which can only be heard when playing the song backwards. While all occult practices are evil in the sight of God, occultists consider the left side as the dark side, associated with malicious black magic while the right side is associated with benevolent white magic, even though Satan is the source of both sides. (Source: Wikipedia.org) So, placing the fang on Obama’s left side represents the darkest form of Satanic power, which will be poured out on the whole world in the last days through the man of lawlessness, the beast. The Bible warns us not to be ignorant of Satan’s schemes so we can stop him from taking advantage of us (2 Corinthians 2:11). He seeks billions of people to follow him into the lake of fire, but he knows no one would willingly go there, so he relies on his craftiness, his age-old tricks of deception, to lure them. Satan and his occult followers prides themselves on their ability to hide in plain sight, so they hate being exposed to the light, which is why I find great pleasure in raining on their parade by letting everyone see their evil schemes. Skeptics might fail to see any hidden messages in Obama’s portrait, perhaps claiming these are all just coincidences, but I think there are too many coincidences to deny and they have even greater significance when viewed in the larger context of many other “coincidences” surrounding Barack Obama. The Holy Spirit showed me this was an evil man before he ever took office. I’m pretty sure that foliage is poison ivy. Great point Carolanne. I found this image of poison ivy and it looks like a perfect match. The toxic plant would definitely cause noisome and grievous sores of the first vial of wrath in Rev. 16:2. I also see Baphomet horns coming out from the center of his head arching outward in the dark shadow pointing outward, or maybe it’s a bat shaped dragon?? Could the highlighted and distorted temple also indicate the deadly head wound? That’s up for debate, but almost looks like a bullet hole that healed. And now I am about to faint I can’t even look at it without getting sick! Thank you so much for this post, and to all of you commenters for your input-it’s imperative we can share these things with skeptical loved ones. That is just creepy! 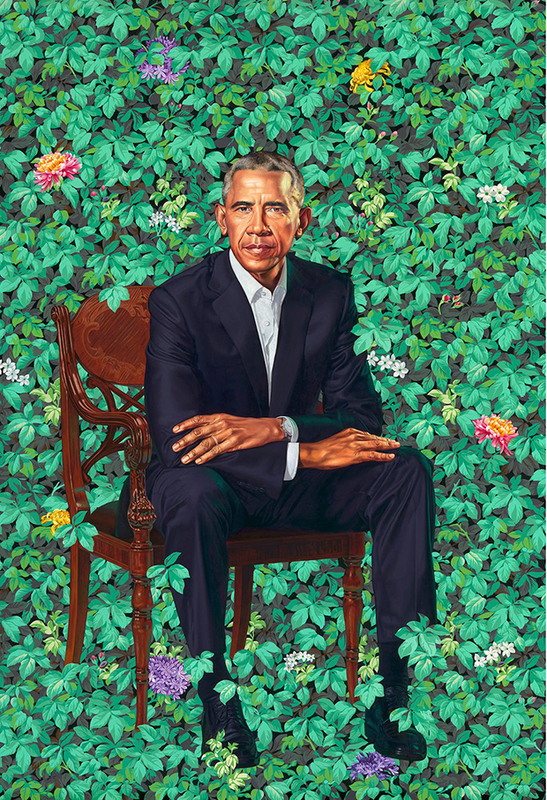 I don’t understand why would they have him sitting in poison ivy foliage for his portrait?! The occultists are known for hiding their evil schemes in plain sight, so this is another example of it. I would love if you would share your dream about Obama wearing the pope’s linen dress. I had a vision of him in a clergy type robe and I’ve seen one other person post on here about him wearing an outfit like the pope wears. Thanks for sharing your dream. I definitely think these 2 men will be working close together in the days ahead, if not already as you said out of public view. I don’t know if it is just me or if it’s the Lord. Time will tell. It seems I have been considering other possibilities to how this scenario could work out. I’ve seen Obama in a clergy (pope) robe also. Is it just symbolic or will he actually take on a religious leadership in this world government that is dominated by religion? I’m wondering if it is possible the arms you seen extending toward each other could be Obama in the pope’s linen dress since you had a previous vision of him in that dress and the black suit could be another leader that promotes him. I’m considering the fact that the roles could be reversed from what we have always believed. Yes Obama as the antichrist in the religious/priestly role heading up the world government and the false prophet could actually be a political leader ( beast in scripture is symbolic of kingdom or nation) that only appears to be Christian promoting this one world government/religion with Obama as the head. I know the pope has an important part to play in the events that are unfolding and I’ve thought he could be the false prophet. At any rate he is definitely a false prophet but I have been considering other possibilities as to how this might play out. It could also be possible since you seen Obama in both the suit and the linen dress and the joining together of hands that both arms represent him in the union of roles he will occupy in the time to come. Just some thoughts. God bless. I dont know about the imagery, BUT, I will say, this portrait is false to the core of portraying the TRUE Obama. It portrays a person of compassion and wisdom. And we know that is NOT the real Obama! So this whole portrait is a deception, a ruse, another ruse put off on the American people. An odd photo for sure, as he appears “suspended” in these leaves as I see no natural crease or break in the bottom of the wall of leaves where a chair could be positioned. And also, it looks like he has six fingers on his left hand, assuming his left thumb is hidden behind his palm. Also if the left side of his temple and head are “illuminated” why doesnt that effect show itself amongst the leaves and flowers? odd Id say or a poor artist who cant depict light and shadows correctly. Yes Jerry. I noticed the six fingers as well. Not sure what that means except I think I read somewhere that nephilem may have six fingers??? I also noticed that his feet and chair are suspended; not grounded. Maybe implying “otherworldly”. Surreal!!! Nephilim did have six fingers. Lack of a tie, has Muslim connection, because the tie is considered Western, and perhaps the symbol of a cross. I’d love to know what is written on the front egde of his seat. Anyone know? I zoomed in on that and it just looks like vertical lines with no hidden messages. I recently read an article on Vigilante Citizen which pointed out that this particular artist is well known for including sperm in all his portraits and he presented the proof. He outlined what looked like a sperm on the left temple of Obama’s face right next to the fang outlined in the photo above. Sister Paula I saw on Fox news this artist has done self portraits holding the severed heads of white people , they showed the portraits on Fox news . Satan loves to brag in plain sight and laugh at us when we don’t see it . Thanks for sharing that news about the artist. That confirms his Satanic qualifications for the job. Great point Christine. This is truly a group effort to bring out all the details. I went back and updated the post to include a zoomed in image of the sperm, plus an explanation. Thanks for sharing that info Paula. Jonathan Kleck also commented about the sperm shape, which also looks like a fang. There’s likely a double meaning there because fertility is a popular symbol among Satanists, which is why the crescent moon appears above the left horn of Baphomet, representing the womb. That’s also why Muslims use the crescent moon as their symbol. So, the sperm shape fits right in. If he is posing within the Ivy plant…I was just led by Holy Spirit to look for the name meaning of IVY it means Faithfulness another imitation of the Lord’s character..he is the only Faithful & Truth. May the Lord in Jesus name, open the eyes of more people for them to see the true motives of this man. God have mercy of us for choosing to close our eyes, ears and heart to the truth. Amen. 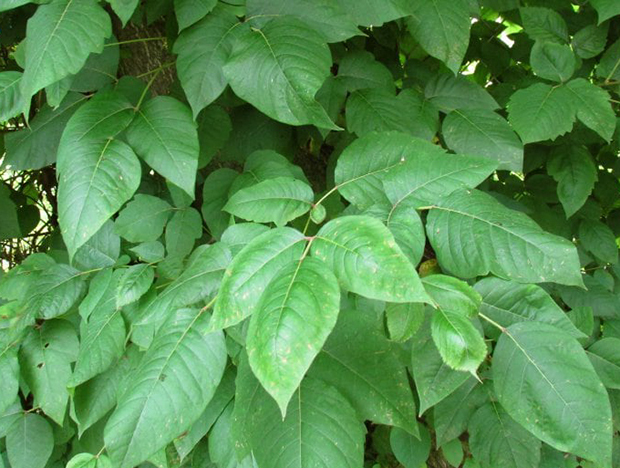 Interesting…..if IVY means Faithfulness, POISON IVY would mean Dangerous Faithfulness or more aptly put, Deception. Obama’s throne set high upon Deception. I noticed a pattern in the leaves as I was studying this image, and it came to me that there might be more to this.. Does anyone remember the Magic Eye images, where if one relaxes/crosses your eyes, an image pops out when the repeated pattern overlaps. So I tried it, and I too see a snakes face above Obama’s face, though different from Jonathan’s reference. If you relax the vision to where the lightly colored leaves on either side of Obama’s face align, one could see it. As this is a painting and not a graphic image, intention must be put into repeating a pattern as there is no copy and paste with a paintbrush. So there must be something to this. 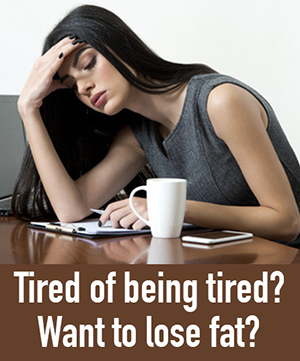 Unfortunately I started getting a headache as I continued crossing my eyes to look for further clues, so I stopped. But I did notice also a repeated pattern at the bottom as well, yet couldn’t continue looking for now. Thought I would post this find in the case others cared to look into this any further. I wouldn’t stress over it, as we all know who this person is, but thought I would throw it out there. I can actually see the fully opened hood of a spitting Cobra in that foliage. They always spit in the victim’s eye, blinding them with their poison.